Conversations on the Internet, particularly social media, are often a reflection of the conversations that one has offline. However, online conversations come with the advantage of not being restricted to a small group of people physically present around you. The barriers of geography and time do not exist online. However, not everyone uses this opportunity for positive messaging. With rapidly growing Internet penetration, India already has more than 241 million users of Facebook alone (The Next Web Report, 2017). At least 136 million Indians are active social media users (Yral Report, 2016), across platforms. Further, when talking about social media, we cannot ignore the penetration of WhatsApp, which has reached more than 200 million users in India (Mashable, 2017). This means 200 million users in India are exchanging messages on a daily basis in real time. Thus, as one of the most popular channels of communications today, social media is both an enabler and a disabler, and it cannot be denied that people with malicious intent often use it to play a significant role in both fighting hate speech and magnifying it. It is, in fact, a tool as powerful as the television with its audio-visual advantages. In an effort to further address the challenge of misinformation, WhatsApp has partnered with New Delhi-based Digital Empowerment Foundation (DEF) to create awareness among WhatsApp users about the need to verify information. In the run up to the upcoming Assembly and General elections, DEF has committed to hold 40 training sessions for community leaders in 10 states across the country where there have been worrisome cases of violence or where there will be state polls before the end of the year. The first couple of such workshops, titled Fighting Fake News, was organised in Ranchi on September 26, 2018. Facilitated by trainers Ravi Guria and Udita Chaturvedi of DEF, the workshop was organised with support from the District Collector’s Office in Ranchi, Jharkhand; a state that has witnessed several cases of fake news leading to violence. DEF was immensely supported by IAS and Deputy Commissioner Ranchi Rai Mahimapat Ray in its endeavour. 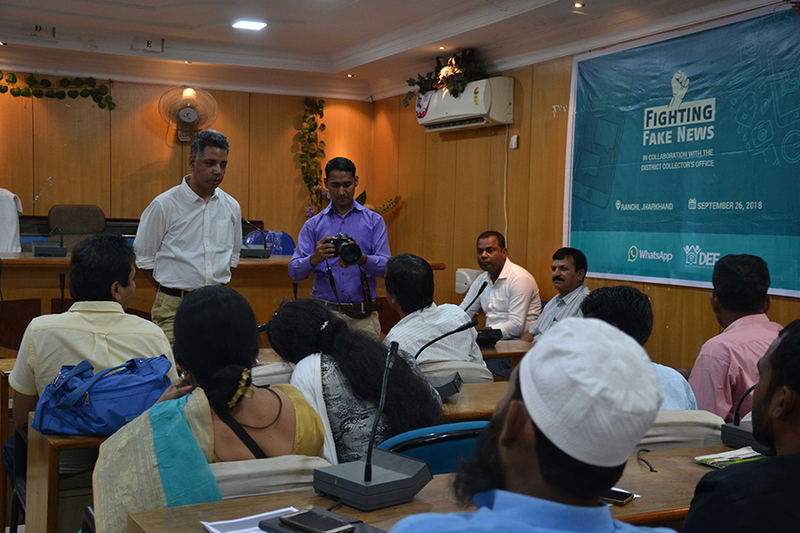 The workshop was attended by 170 individuals who came from different stakeholder groups, including officials from the district administration, members of the city peace committee, officials from the law & order division, NGO representatives, village-level frontline workers, students, teachers and scientists from the Bisra Agriculture University. The workshop was also attended by Deputy Development Commissioner Divyanshu Jha, ADM Law & Order Akhilesh Kumar and Deputy Director AIR Ranchi RK Gautam. The three-hour workshop focused on differentiating between fact, opinion and fake; understanding the “other” perspective; learning techniques to verify information; and leveraging WhatsApp’s features for restricting unwanted communication. “As an organisation that is committed to taking the rural and marginalised population online, we also see this as our responsibility to ensure that they know how to keep themselves safe on the Internet, both from security threats and fake news. We at WhatsApp and DEF hope these training workshops will help build an empathetic and conscious community of WhatsApp users who learn to respond rather than react to every message they receive,” says Osama Manzar, Founder – Director of DEF. In addition to the 40 trainings, DEF is also set to incorporate the training against misinformation and fake news as part of their network of over 30,000 grassroots community members in seven states. In 2013, an article in the Hindustan Times cited professor Badri Narayan from the GB Pant Social Science Institute in Allahabad as saying, “From word of mouth, communal polarisation is now moving online. This is a dangerous trend since the Internet is very potent.” In 2015, a report by the Pew Research Centre on global restrictions on religion, The Social Hostilities Index, ranked India fourth with an index value of 8.7 out of 10, after Syria, Nigeria and Iraq. The Social Hostilities Index looks at 13 indicators—which include crimes motivated by religious hatred, mob violence related to religion, communal violence, religion-related terrorist groups, the harassment of women for “violating” religious dress codes and proselytising—to measure hostilities around the issue of religion. This trend is not unique to India. It is visible in various other countries as well. It’s 2018 now, and in the last three years, we’ve seen social media, especially WhatsApp, being used as a popular tool to disseminate hate speech and fake news. According to data from IndiaSpend, there have been more than 65 cases of mob violence in the country this year; and 74 cases, since January 2017, of mob attacks triggered by rumours of child-lifting alone. The phenomenon of fake news threatens India’s democracy and secularism. “DEF has been a pioneer in expanding digitally literacy across India and we are grateful to work with them to address the challenge of misinformation. Our goal is to help keep people safe by creating greater awareness about fake news and empowering users to help limit its spread. In addition to the steps we are taking within WhatsApp, we believe impacting lives through the power of education is critical to helping achieve the vision of a Digital India,” says Ben Supple, Public Policy Manager at WhatsApp. With the availability of cheap smartphones and affordable Internet plans, WhatsApp has become the most popular social media platform in India with over 200 million monthly active users. While WhatsApp has already taken several technological measures to curb the problem of misinformation (such as the ‘forwarded’ tag and limit forwarding to five chats at once), it is also eager to tackle the problem socially.